Eurel Informatica approached the concept of Videorecording by developing a project for supplying A/V recording systems for criminal trials. On the basis of this experience that focused on specific, innovative efficacy and strict operating rules, our Company gained a know-how followed by the introduction of the Multimedia Integrated System for Law-making Assembly Halls. Videorecording operates on a system of Audio/Video filming and recording, automated and managed by the Electronic Voting System and the Speaker Management System. 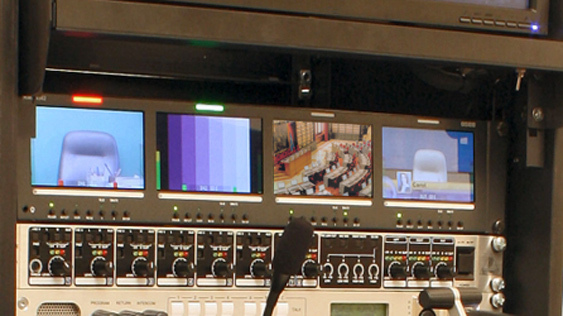 In practice, when the Videorecording System is activated, all the sessions are videorecorded in analogue and digital form and indexed with all the parameters defining the debating phases, for example the topic of each intervention, the name of the Speaker and the verifying and voting steps. The Videorecording System is integrated into the Video Assembly platform which enables the Multimedia Integrated System for Law-making Assembly Halls to broadcast sessions onto Internet via WebTV. It is easy-to-use facility for the public to consult and offers details of contents and search keys with giving names, dates, session numbers, discussion topics, etc. Equipments for delivering and exporting onto physical media (CD/DVD/MemoryKey) as well as the network. Availability of audio/video signals for broadcasting filming onto internet.